ST. CROIX, USVI — Who will be the best Democrat to face Governor Kenneth Mapp and the independent challengers in the general election? Ask any of the three men vying for the Democratic nomination during the August 4th primary, and they would boast about themselves, their past and present accomplishments and leadership skills to lead the territory into the future. These men, Albert Bryan, Angel Dawson and Allison Petrus, sat next to each other and fielded questions from a panel and later random residents during a forum held at Chops in Sunny Isle on Thursday evening. The event was organized by St. Croix Development, WSTX Radio, the St. Croix Chamber of Commerce and the Democratic Party. With voting just over a month away, the Democrats have been crisscrossing the islands seeking to gain an advantage over each other. During the Thursday forum, all teams expressed confidence in their ability to win the primary election. And they sought to establish what sets them apart. “There’s no Paul E. Joseph Stadium, they’re only now beginning to pave the Melvin Evans Highway, they’re only now beginning the waterfront expansion on St. Thomas, and it took them a year and a half to do one block of Main Street in St. Thomas. This is unacceptable,” Mr. Dawson said as he castigated the governor during his closing remarks. 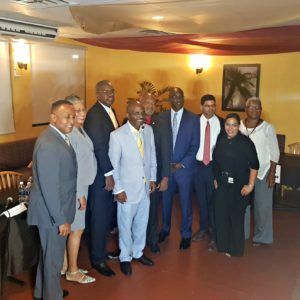 “If you believe in a better tomorrow, you will embrace the team that not only speaks about what they want to do, but can tell you what they have done with experience in the relevant areas,” Mr. Dawson added, speaking of himself and running mate Marise James. And Mr. Petrus, who employs over 100 people at his various businesses in St. Thomas, said what makes him standout from his fellow Democrats is that he is actually living and doing what the other candidates are promising to do. “The questions that you have [on] how do we move forward, the questions they have answered, these are the things that I’m doing in my life experience right now: creating jobs, creating a micro economy whereby things are moving, dollars are moving — this is important to us,” Mr. Petrus said. Political observers have said that the general election will most likely not be determined on November 6, but instead at a later date during a runoff race. This opinion is based on the number of candidates running — about six independents (Soraya Diase-Coffelt, Moleto Smith Jr., Warren Mosler, Adlah Donastorg, Janette Millin Young and possibly Positive Nelson, who is currently mired in a court battle to save his gubernatorial bid) along with the eventual Democratic nominee and Governor Kenneth Mapp. Yet even as a runoff is expected, the Democratic Party, at least by the looks of it on Thursday evening, appears to be uniting after a brutal few months that pitted teams against each other when running mates were being chosen. The candidates, while they have worked to demonstrate clear distinction between their respective teams, displayed a visible level of cordiality that bodes well for Democrats. In fact, the teams have committed to rally behind whoever the eventual primary winner is in a united front to remove Mr. Mapp from office, who many Democrats believe have not led the territory in a manner befitting the office. The Consortium will host one-on-one interviews with the Democratic candidates in July, with questions being posed by Consortium President and Publisher Ernice Gilbert.